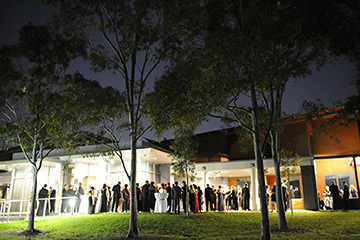 The Federation Conference Centre in located on the fringe of the city in the inner Sydney suburb of Surry Hills. There are a number of easy transport options within walking distance of the Conference Centre, including Central station, providing access to local and interstate trains, buses & light rail. 3 parking stations can be found within walking distance to the Conference Centre, and it is only a short 20 minute journey to Sydney International and Domestic airport, easily accessible via train or taxi. 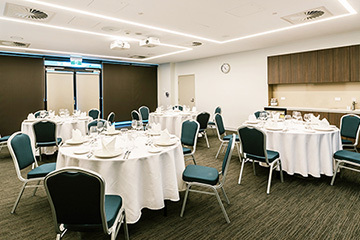 The Federation Conference Centre is a perfect venue for those travelling interstate as it is close to the hustle and bustle of Sydney City, including a number of quality hotels and restaurants. 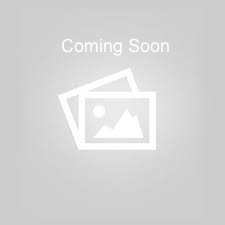 The Federation Conference Centre is a purpose built venue with a contemporary design and professional facilities. With 8 flexible meeting spaces catering for 30-402 delegates, the facilities are ideal for conferences, seminars, corporate meetings, workshops or awards ceremonies. A comfortable and spacious auditorium that can seat up to 402 people, offering tiered seating that ensures all guests have a clear view of the stage and screens. The auditorium is equipped with audio visual facilities such as a state-of-the-art audio system, projectors, microphones, direct input (DI) units. All of our other meeting rooms are also equipped with audio systems and microphones. Data projectors, Teleconference Facilities, WIFI, TV monitors and DVD players are also available upon request. 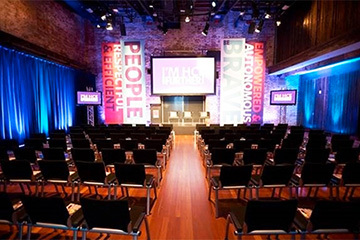 Our Event coordinators are well equipped to provide technical support onsite for your meeting, however, for more complex audio-visual needs we partner with Prime Audiovisual who offer a more extensive range of AV equipment and presentation technology services for all types of conferences and corporate events.